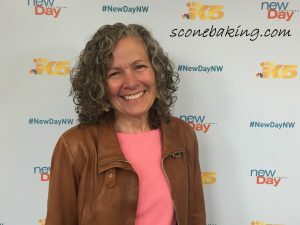 Today I had a special opportunity to share my, “Mac SPAM Hello Dolly Bars” recipe, on the “New Day NW” show on KING 5 TV in Seattle. These Hello Dolly Bars won 1st Place in the Great American SPAM Championship at the 2017 Washington State Fair. I want to thank Margaret Larson and the staff at King 5 TV and the New Day NW show for being so nice and welcoming me on their show. I had a lot of fun showing everyone how easy these bar cookies are to make and how you can get to the “sweeter side of SPAM”. I also want to thank the Blue Ribbon Group for sponsoring the Great American SPAM Championship at the Washington State Fair.